In what the company called Blogger's biggest announcement in several years, Google introduced a versatile template designer this morning that opens up a wide array of creative high-quality designs to the millions of users on the platform. The launch comes in the wake of Blogger's 10th anniversary, and raises the bar in terms of both appearance and ease of customization, guiding Blogger users to leverage new professionally designed themes with thousands of background images, and customization on layout and color themes. 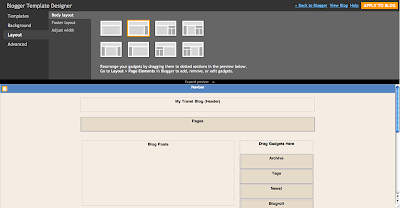 The combined package could mean the end of flat-looking Blogger templates, and gives potential WordPress users or switchers a serious alternative. The new Blogger Template Designer, which launched on Blogger In Draft, features 15 new professional templates at introduction, with more to come, including anticipated user submissions, customized layouts with up to three columns, hundreds of background images via a partnership with iStockphoto, and the ability to change colors and fonts across the site. The package, which I will definitely be messing around with shortly, is an effort to give everyone their own personal look and feel that doesn't appear to be "cookie cutter". "How people look on the Web is really important, especially if it comes to publishing or blogging," said Siobhan Quinn, a product manager of Blogger at Google yesterday. "We wanted to empower people to create their own unique design, with tools that are extremely simple and powerful at the same time. 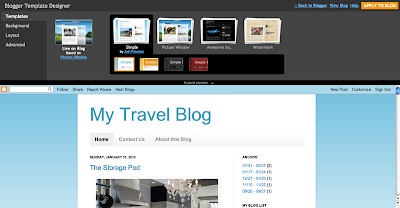 We believe the blog is your blog, and you should be able to do anything you want with it." 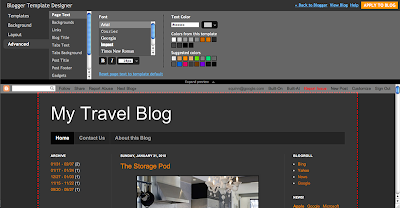 Prior to this morning's launch, the vast majority of existing Blogger templates were created by or impacted by Google's then visual design lead Doug Bowman in 2005. With Doug now at Twitter for a year, and the templates looking somewhat stale, not to mention difficult to parse in HTML (trust me), it is high time for new designs. The introduction of a few dozen templates for Blogger wouldn't be that much of a big deal, except for the fact the company has leveraged the engineering talent at Google, and applied that to its new design options. As was explained yesterday, every template can be applied to every available site layout, and if users opt to tilt their blog toward one specific color theme or another, care is taken to make sure the text and images are not only readable, but look good. This customization leverages a new concept of a "main color theme" which as Quinn explained, "lets you shift from one complementary set to another, with an infinite number of palettes in the color spectrum." Blogger users who tap into these new designs will get the option to modify the existing templates through a Layout tab that lets them apply any template to any layout, including 8 body layouts and 3 footer layouts. You can even adjust the width of any column to get customization down to the pixel. As the sidebars are edited, they present different "drop regions" for Gadgets you may have installed. And if you want to get into the code, there is always the option to muck with the HTML to make it yours. Should you want to add a customized CSS file, you can add that as well, and even remove it later without seeing your blog fall apart, as Blogger uses your code to override their own, not deleting it outright. With tens of millions of Blogger blogs out there, even if Google offered hundreds of pre-made templates, they would still be recognizable as Blogger hosted. Now, if Blogger users do revamp their blogs with the new Blogger Template Designer, they can take on the author's personality in a new way. Watch this space, as I may be leveraging them myself shortly.